Many years ago I learned how to make my own gouache paint since all the commercial brands I could find at that time were in small tubes that I used up rather quickly. Raw pigment was a bit more difficult to find back then than it is now. Anyway, here’s a sample batch I made recently of some burnt umber gouache. It’s one of the simplest paints you can make, short of egg tempera. The only issue is finding all the ingredients. Essentially you just mix it all together and start painting. This pre-mixed binder can keep for several years, as will the paint. Pour water in a blender and add powder slowly while blending. Let it sit @1 hour. A faster method is to heat the water to boiling, add gum slowly while stirring, let cool to room temperature. The blender method tends to give me a clearer liquid. Strain liquid through a cheesecloth if it’s lumpy. 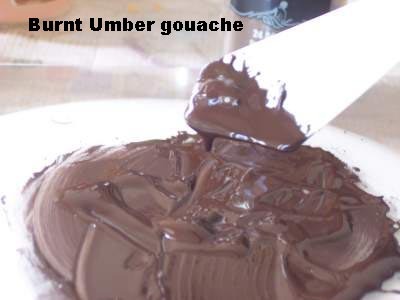 Mix together in a warmed bowl and add in gum arabic solution slowly while stirring. Place pigment on a large glass or plexiglass plate. I usually dump out about 1 teaspoon of pigment at a time, as shown above. Make an indentation in the pigment pile. Add a small amount of binder solution and mix together thoroughly. A good target is half as much binder as pigment (1:2) but some pigments require less. Keep adding just enough binder to make a smooth paint to your liking. Any pigment that is difficult to get wet can be helped along with a teaspoon of grain alcohol. Rub a small swatch of fresh paint on a clean spot of the mixing plate. Let that air dry for several minutes COMPLETELY (this may take longer than you think – give it 20-30 minutes or so.) Rub the dried paint with a cloth. If paint completely lifts then the mixture is too weak or there’s not enough binder. If the dried paint has cracks then there’s too much binder. 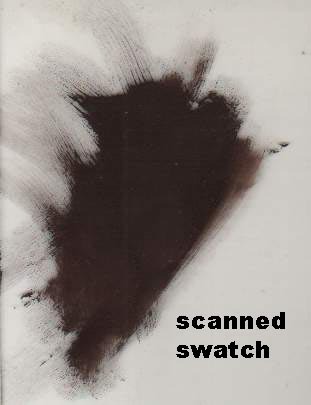 Those can be hairline cracks, so I like to make a high-res computer scan of the dried paint to be certain. If you find yourself using up those tiny tubes of paint, making your own paint can be much more economical, especially for expensive or hard to find colors, and you have more control over paint quality. Please remember that pigments have certain health hazards and require careful handling in powder form. This is the first I’ve ever heard of someone making their own paint. Good for you! Glad you liked it. If you try it out, let me know how it goes. I’m always tweaking the ingredients, but these work well. Glycerin and honey essentially do the same thing, so those amounts can be adjusted, but I wouldn’t recommend increasing them or else it gets sticky and takes forever to dry. Thank you so much for this!! The cost of gouache has kept me from pursuing as much as I’d like to -those little tubes last no time at all. Well, Nancy, you could see more works if I made more. One problem with having a variety of paint media in the studio is they all want attention. I try to fit some gouache in when I can. It’s a lovely medium. I hope you find the information helpful. Hope I’m not troubling you with questions, and only if you have the time can you tell me, from your experience, what genres gouache is best suited for. blend better than I have before by a long chalk. brushes. Is gouache best done with sables though. Also I found the later bands dried before I could get to them – maybe am just slow. I don’t mind the questions. I’m happy to answer as best I can. I’m glad to hear the exercise helped you. I think gouache is as well suited to portraits as any other medium can be. Faces are no different than any other thing you might paint. That said, each medium has certain strengths and shortcomings compared to others. Where gouache becomes a particular challenge is blending large areas smoothly. Casein has the same issue. The usual approach is to use thin washes of paint, like watercolor. Another way is to put the burden on the palette and mix your color values gradually and quickly. Where it excels is in quick sure strokes of unmodulated color. Most artwork in gouache is relatively small, around letter size. I have seen some much larger, 2 to 3 feet, but it’s rare. Sables brushes can work okay, but tend to be rather heavy. It can be easier to handle bristles softly but the hairs tend to be a bit stiff. My preferred brush is a nylon shader, which has a soft flat tip, or long flats. Hope that helps some. Stay with it. Thanks so much for your answers! Thinking about doing letter size paintings in gouache makes me a look more confident; had no idea that they were done on the small side. Will also check out the brushes you use. I really appreciate this David, and I’ll stay at it. Now back to watch the video just posted. It’s a beautiful spring, blossomy day here in Vancouver BC and hopefully it’s good where you live too. make that “a lot more confident” rather than the garble first typed. I should clarify what I said about sables being heavy. In particular I was speaking about the common sable rounds. Sable is the type of hair, so they are available in different configurations including flats. Sign-painting painting brushes (aka “show card”) I find to work really well for me, and some of those are sable. I think it is great when artists share these formula’s. It is so expensive to paint, and the art stores charge way more than their products are worth. I know, I was an Ink formulator and 1 gallon of ink cost less than $10 to make and we charged $150 for it. As I study Art History I find that lots of the masters painted on Board. Which could be high grade plywood, with a good coat of primer, and nailed to stretcher boards? Thanks for sharing that, Mot. $150? Wow! Plywood, as we know it today, is a fairly recent engineered product, historically speaking. Although some samples of it have been unearthed in Egypt and China, the process was a lost art until around the first of the 20th century. Artist who painted directly on wood, such as Rembrandt and Constable, would often use single planks with a maximum size of 6 to 12 inches or so in one direction, depending on the species. Larger pieces would have to be joined together. Alternatively, some artists would cover them with paper or canvas before priming. Thank you for such a Wonderful information. Thanks for putting together this terrific guide. Your work is fantastic – i especially like your drawings! however, decent gouache is becoming increasingly expensive, especially for us as we use so much of it. The main colour we need bulk of is white. We’ve always found W&N to be the best and they did used to do 100ml pots, but they were discontinued, and all we can now only get 14ml tubes! I followed this guide and made a bulk amount of white (about 700ml worth!). The first time, i mixed equal measures of binder to pigment, however i concluded i needed alot less binder to pigment for white, as the white didn’t hold its intensity and greyed off. The paint was also shiny once painted. I experimented a bit with small samples to try eradicate the shininess, however had no luck. The next batch i made with alot less binder to pigment worked alot better regarding intensity of colour – however it was still shiny. Its not terribly important that the paint is shiny, as we scan in our designs anyway, however, i would really like to sort this issue out for when showing customers the original artwork. Because i’m making this paint in larger quantities, i’m not mixing the paint on a slab, rather, blending the contents together in a blender. It is a bit grainy still, however after a good mix in a smaller container it improves. Are you able to give me any suggestions why my paint is still shiny? And if it is because im not mixing it properly and blending instead, do you have any other suggestions how i can make the gouache on a larger scale? Sorry for waffling and taking up you time! Any suggestions would be marvellous! Hello, Richard. I’m glad you’re finding the information here helpful, and have taken steps to make your own paint. Regarding shininess, the glycerin could be the first culprit I would investigate, so try reducing that amount by 25% or more to get better results. Gum arabic might also be making it shiny, but I would target the glycerin first. The amounts I mentioned above sometimes have to be adjusted for different pigments, so expect to play around a bit with the ingredients. Are you using titanium white pigment? If you’re using other types of whites, or mixing in fillers that can effect the intensity and possibly glossiness. I would not recommend using just a blender instead of mulling your paint. Even if you only use a metal spatula as I often do, that will help to better break down the pigments and coat the particles with binder. I’m not sure if mulling would reduce the shine, but it might. That sounds great, i’ll have another go along these guidelines, and i’ll be more disciplined and try mulling. I’ll get back to you with the results! 🙂 Cheers! 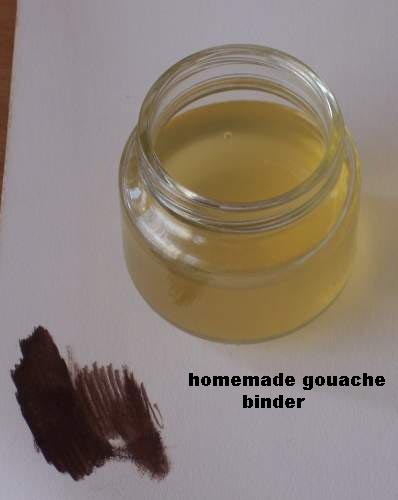 This time i’ve made some binder using 75% of the recommended glycerin. And i bought a big mortar and pestle to mull with. The mortar and pestle has definitely ground the paint together better. However the glossiness is still there..
I’ve made a sample with 25% less glycerin, and one with less gum arabic. Both are still shiny..
I’m using 1 / 4 binder to pigment. Damn this glossiness! I wonder if its anything to do with the ingredients i’ve used, if they are slightly the wrong thing or something..
I’ve been using powdered arabic gum, could that be a potential reason? If you mean you’re not diluting the powder first then that would be way more gum arabic than you need. Typically, that’s 1 part gum to 2 parts water, and it should soak for several hours before using. I follow the first step of blending it with distilled water, and then leave it for over an hour. My binder is also much darker than the binder in your picture. I really don’t know where i’m going wrong, as i’m following your steps down to the exact measurement. 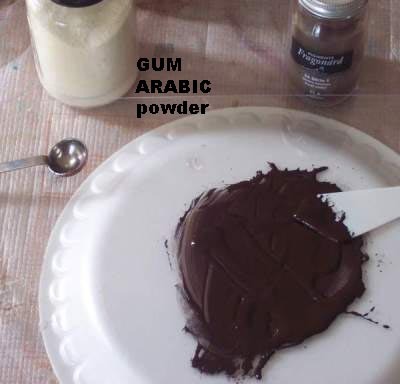 I’ve ordered some liquid gum arabic as i don’t know what else to try. In this case, i take it i don’t need to dilute it like in the first step? It does sound as though the gum arabic you’re using is what’s causing the extra shininess. If you use liquid gum arabic you won’t have to dilute it further. I have the same shine problem with titanium white. Frustrating. Cannot use commercial paint or liquid gum because I am allergic to the preservatives in them. Maybe I have to accept the only way to go is home made transparent watercolor. Sigh. Glossiness or shine is mostly caused by the binder. Fillers like kaolin can help reduce the effect some, but that also decreases the opacity. I tried adding truckloads of dextrin and caolin, but neither of them affected the shine. With other pigments I have successfully deleted any shine with d/c. My PW6 was from Schmincke, and their Horadam PW6 watercolor in both pans and tubes also shines in heavy application… But today I bought Titanium-Calcium White from Rublev and it is absolutely chalky matte with no shine whatsoever, and I was using basic watercolor recipe with no dextrin/caolin. I even added some honey! So mission accomplished, phew! Good to hear that worked out for you.